This forum post is for discussing the NCHYSIS Ride. If you have a bike sound system, please bring it on the ride. Also, be sure to use an FM radio as the audio source. We will be broadcasting on low-power FM at the ride. 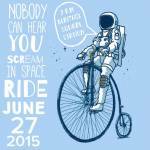 We have two sound system bikes confirmed for this ride. We could always use another. Is there anyone else who can bring a sound system? I had this on my calendar and everything, but I got offered a show on the 27th and I don't really turn down shows. On the bright side, I've got a little T amp coming in the mail. Gonna be ready for the next one.